This unit introduces young students to the Great Barrier Reef as a place people use for resources, work, recreation and leisure. Students at this age readily identify with favorite places to play and explore. Initially beaches, coastal areas, a public aquarium or marine discovery centre serve as a focus for class activities as access to the Great Barrier Reef isn’t always possible. Students investigate the natural and human components of the Great Barrier Reef as well as the groups involved with the use, protection and conservation of the Reef. These groups may include Federal Government, State Government, private organisations, service, community and volunteer groups. In examining the Great Barrier Reef, students can also be given a preliminary introduction to the ways the Great Barrier Reef is a natural and protected landscape of significance. People value the Great Barrier Reef in different ways. How and why is the Great Barrier Reef important to different groups of people? 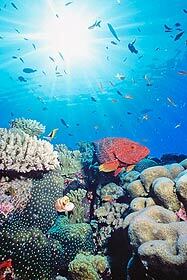 Why and how do people cooperate to care for the Great Barrier Reef? Anchoring, animals, behaviour, birds, boating, care, colours, conserve, corals, diving, dugong, dolphin, environment, equipment, facilities, features, fields, fish, fishing, garden, grasses, human-made, leisure, litter, local, look after, maintenance, national park, native plants, nature, ocean, ranger, pollution, protect, reef-walking, river, rubbish, safety, sailing, sea, signs, snorkelling, tourist, trawlers, tracks, turtle-watching, visiting, water, whale-watching, work.